Uses: Nutrient, vitamin or mineral deficiency/ supplementation. Anti-inflammatory support. Anti-aging agent. MultiCare is a specifically formulated comprehensive blend of vitamins, minerals, antioxidants and phytonutrients in which your body might be difficent. Multicare is a plant based multivitamin and mineral formula to support optimal nutrition and to facilitate maximum nutrient absorption. Our bodies are exposed to harmful "free radicals", chemicals and stressors from our environment that if left untreated can lead to aging, inflammation and disease. 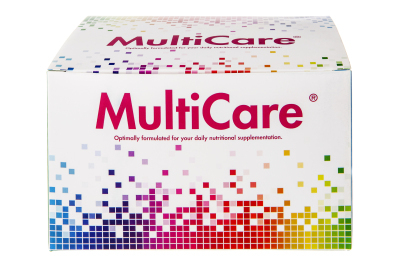 Multicare is the first line in defence to support healthy immune, metabolic and nutritional health. 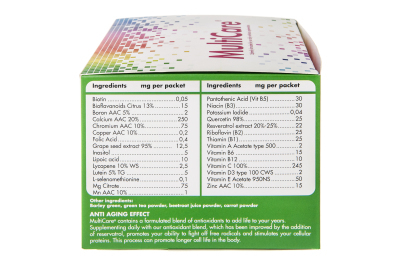 Multicare contains nutrient dense, antioxidant loaded and superfood rich barley grass, beetroot and carrot powder concentrates along with green tea, reservatrol and grape seed extract to combat inflammation and scavenge free radicals in an easy to use four capsule super vitamin and mineral sachet.